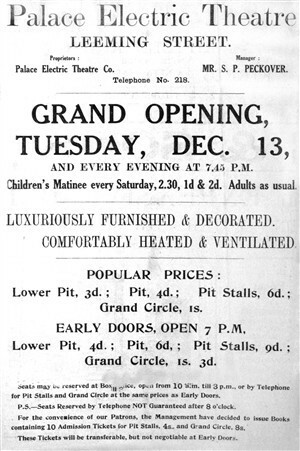 Tuesday 13 December 1910 marked the grand opening of the Palace Electric Theatre on Leeming Street, described as Mansfield’s Broadway with three Theatres within 50 yards – The Grand, The Victoria and the Palace. Building was designed by Mr F.P. Cook and was built by A.F Houfton. 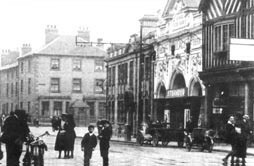 It was described at the time as ‘the last word in electric theatres - the acme of refinement and novelty!’ Whole building was completed in 22 weeks and was the town’s first purpose built cinema. The Pit had 500 seats, the Stalls had 230 seats and the Circle had 120 seats, 850 in total. Admission was 3d Lower Pit, 4d Pit, 6d Stalls and 1/- for the Grand Circle. After the First World War and the introduction of Entertainment Tax, the entertainment boom faded. In July 1923 the assets were transferred to a new company, Sherwood Palaces Ltd. The attempt to take over the Victoria Theatre drained the Palace’s coffers and both buildings suffered from under-investment. By 1929, talkies were all the rage, but the Palace had not moved on. Its ads read, ‘Perfect Pictures’, without even naming them. This was a euphemism for ‘sorry, no sound’. Sound facilities were installed in January 1931 and the first show was ‘Love Comes Along’. The Palace was competing with the luxury Plaza and Ritz and it showed mainly re-runs of old films at a cheap rate. The steady supply of children queuing for the ‘Tuppeny Rush’ was not enough to maintain the fabric of the building and in 1937, the ornate plaster frontage was replaced with plain rendering because bits had started to fall off onto pedestrians. The War provided a new lease of life for the cinema and in June 1944 the Palace closed for the installation of fireproof curtains and other alterations to transform the venue into a theatre. It reopened on 3 July with Tom E. Bradley, ‘your favourite comedian’. Other big names such as Larry Grayson, Danny La Rue, Hylda Baker followed. It also became the home of repertory theatre until 19 July 1954 when Sherwood Palaces refused to let lessee Barny Lando turn it into a cinema again. The theatre closed and in August the Mansfield Reporter asked, ‘Way now open for a Civic Theatre?’ The Council declined and within two years, the building had almost become a wreck. Disabled access improved and disabled toilets fitted. Lottery Application was submitted in 1996 to Arts Council England (ACE) to refurbish and upgrade the facilities. In October 1996, £40,000 was granted to pay for consultancy to test the feasibility and viability of the project. The Theatre closed in May 1997 for refurbishment. 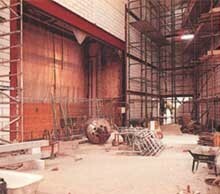 The old stage area was totally demolished, leaving a gaping hole at the front of the auditorium. This led to a total rebuilding of the stage with increased height, width and depth, the fitting of a counterweight flying system and the installation of an orchestra pit lift. This allowed the front of the stage to be raised or lowered to form either an apron in the up position or a pit in the lowest position. Sight lines were improved by removing the centre aisles in the front stalls to the walls, thereby moving the seats more to the centre. New sound and lighting systems were installed, greatly upgrading the technology to support the touring productions. Importantly, new offices with IT equipment were built providing valuable working space for administrative and technical staff who previously had none. The front of house areas were refurbished, creating an attractive public space that was warm and welcoming and provided an area for theatregoers to purchase their refreshments and to mix and mingle prior to the shows and during the interval. A computerised box office system in the newly built Box Office replaced the old books of paper tickets, abolishing the original cubicle which opened directly onto the street. There was also an interactive neon light public art installation created for the façade. The Theatre reopened on Monday 15 December 1997 in time for the first performance of the pantomime Mother Goose. Since then the Palace Theatre has gone from strength to strength, drawing its audiences from Mansfield and also well beyond the District’s boundaries. It celebrated its centenary in 2010 and in 2016 experienced its most successful year ever with over 100,000 customers attending its productions and with the average attendance rising to 74% or 395 people per performance.